Nintendo's fifth home console was unveiled at E3 2005 and released in the U.S. in November 2006, with Japanese and European releases following in December. The system shunned a powerful graphics processor in favour of motion controls, a risk that ultimately paid off with the system breaking sales records worldwide. The Wii uses the serial code RVL (Revolution) for its hardware. 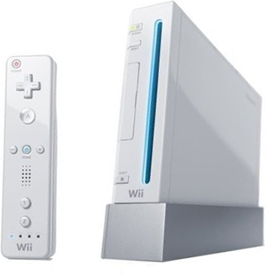 The Wii can be laid flat or stood vertically in the Wii Console Stand, and is Nintendo's smallest home console to date. The Wii features a "Channels" menu, including news and weather updates, the Wii Shop for downloading Virtual Console and WiiWare titles to the system's internal hard drive or onto an SD Card. Updates are received through Wii Connect 24, a service that allows the Wii to receive data even when it has been switched off. The optical media drive accepts both Wii and GameCube games, and features a blue light that illuminates when new data is received through Wii Connect 24. When stood vertically, two hatches on the top can be opened to reveal ports for GameCube Controllers and Memory Cards. 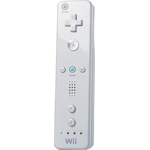 The Wii Remote is a motion sensing controller with 6 buttons and a + Directional Pad, as well as a Home button for returning to the Wii menu and a Power button that can be used to switch off the Wii. The base of the unit features a port for attachments, as well as a hook for attaching a wrist strap. Each Wii Remote also features a built-in speaker and rumble functionality, allowing for multiple forms of feedback from games. The Nunchuk attachment connects to the base of the Wii Remote, and is named after a Japanese weapon (two sticks connected by a chain or rope). It features two additional button inputs, an analogue control stick and three-axis accelerometer for basic motion control. The Classic Controller is a standard-style control pad that connects to the Wii Remote. It features 6 face buttons, 4 shoulder buttons, 2 analogue sticks and a + Directional Pad, as well as a Home button. The Classic Controller is predominantly used to play classic games downloaded for the Wii Virtual Console. A Classic Controller Pro was released, more closely resembling a GameCube controller, and a special Super Famicom / SNES Classic Controller was released exclusively through the Club Nintendo programme, being an exact copy of the SNES Controller. A balance board shaped like a set of scales, and containing four pressure sensors that are used to determine the user's center of balance and weight. The Balance Board was launched with Wii Fit and became one of the most popular accessories for the Wii. A plastic gun-shaped shell for the Wii Remote and Nunchuk. The Wii Zapper was designed to improve accuracy and comfort while playing shooting games, as Nintendo designer Shigeru Miyamoto noted, it can be hard to keep a steady hand for long periods of time with just the Remote. 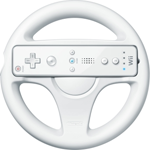 A plastic steering wheel-shaped shell for the Wii Remote, designed for driving games. The Wheel features spaces in its design for pointer functionality and access to the B Trigger button and wrist strap hook. 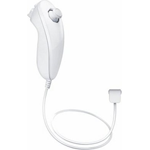 Released alongside Wii Sports Resort, the WiiMotion Plus is an expansion device for the Wii Remote that adds a tuning fork gyroscope motion sensor to the abilities of the Wii Remote, allowing for more 1:1 accuracy when playing games. The device has been superceded by the Wii Remote Plus. 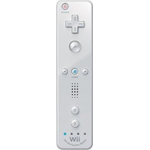 The Wii Remote Plus is a combined remote unit featuring the functionality of the Wii Remote and the abilities of the WiiMotion Plus. The Wii Remote Plus is the same size and design as the original Wii Remote. A microphone accessory that connects to the Wii's USB port. The Wii Speak is supposed to be placed near the TV so everybody in the room is able to communicate with other Wii owners through the internet. It can either be used with compatible games or using the dedicated Wii Speak Channel. 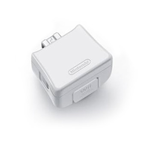 An adapter for connecting the Wii to a wired access point if a wireless internet connection is not available. It connects to the Wii's USB port.